It’s the end of an era at the Ketchum Post Office, as two of its longtime employees are set to retire July 31. 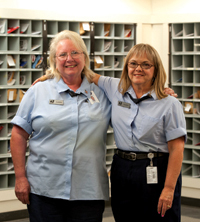 In a city as small as Ketchum, residents often have a close bond with Postal Service employees. Postal workers don’t just sort mail and scan packages—they watch people move away, newcomers arrive, kids grow up and people pass away. In fact, to get a good temperature check of any small town, it’d be wise to ask those who handle the mail. Both women have a little trepidation about retiring. West’s daughter caught her crying the other day as she contemplated her decision. So far, all West knows for sure is that she’ll have more time for exercise. Davis, on the other hand, knows exactly what she’s doing. Her husband Lee—they just celebrated their 41st wedding anniversary—is also retiring July 31. They plan to buy a new truck and RV and hit the road to travel. Davis says the only road trip plans are to stay away from cold weather and fulfill one of her dreams: to see the Smithsonian Museum in Washington, D.C.
“Help Wanted” signs are posted in the Ketchum Post Office, and the two veteran postal workers warn that the job isn’t easy. You need to pass a background check and get special training, based on where you’re positioned in the office. Working at the front desk has a unique set of challenges, the women said. When both the women started in the 1990s, there was no digitalized scanning of packages. The old system, however, did have its boondoggles. Money orders had to be carefully collated back then and mistakes meant a pay cut for employees. Davis and West remember a male employee who, several years ago, accidently printed a money order for $500 dollars instead of $50. The order was cashed and the employee had a $450 deduction from his paycheck. Despite modern changes, like the Postal Service’s new partnership with UPS and Fed-Ex, both women are confident in the lasting power of the community post office. Davis said that emails and texts are no substitute for the classic letter. “An email or a text, you can’t put that in your drawer and pull it out and say, ‘Look what they sent me,’” she said. Their supervisor, Postmaster John McDonald, said Davis and West have been indispensable. There are simple pleasures to the job that both women will miss. Davis likes waving to kids picking up their mail and delights in their surprise when a voice speaks to them from the small metal box.